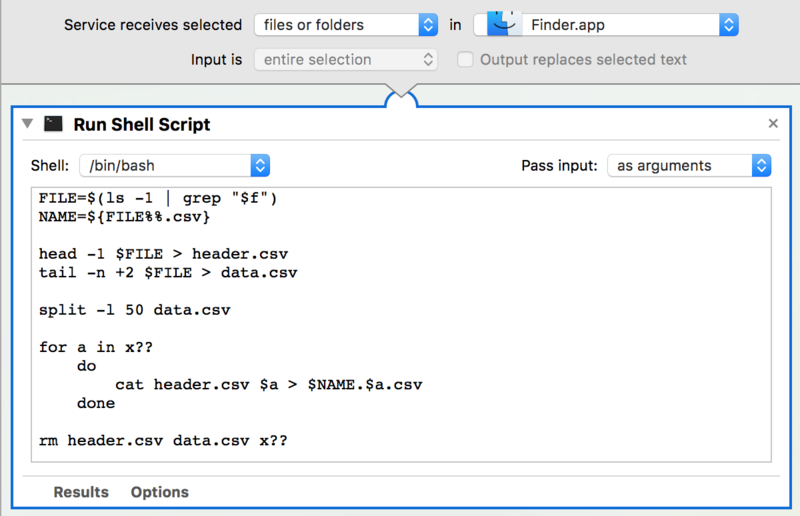 I am trying to create an Automator Service for Finder's Right-Click Context Menu that can split any selected csv file, whilst copying in the original header at the top of every file. This script will split MY_CSV_FILE.csv into new files with max 50 lines while copying in the original header at the top of every file. The new files will have the original name appended with xaa, xab, xac etc. Regarding the Automator setup, this is the Service I'm currently working on. The problem right now is that I'm unable to pass the Selected File in Finder to the Bash script. Service receives: files or folders in Finder.app. Pass input to Shell script: as arguments. I have removed #!/bin/bash from the top of the Shell Script and set the Shell to: /bin/bash. I switched MY_CSV_FILE.csv for "$f" – not sure if that's correct. Do I also need to specify the path using something like "$@" for both the input file and the resulting output files? I haven't done something like this before, so I'm not really familiar with that variable and "$f" for that matter. How could I make this work? I'd like the resulting files to appear in the same folder as the file I select to run the Service on, via the Finder Right-Click Menu. It would be even better if the Service only accepted csv files. tail -n +2 "$f" | split -a 3 -l 50 - $t/tmp. cat $t/h.tmp $s > "$fn"
echo "The file '"$fn"' already exists!" As presently coded, it handles one or more files passed to the service. Makes sure the object being acted upon is a file, not a directory. Makes sure the file has a .csv extension (regardless of the case of the extension). Checks to see that the output filename doesn't already exist, and if it does, it cleans up and exits. Writes to a file with a numerically incremented filename, e.g. file.001.csv, file.002.csv, etc., in the same directory as the file(s) passed to the service. 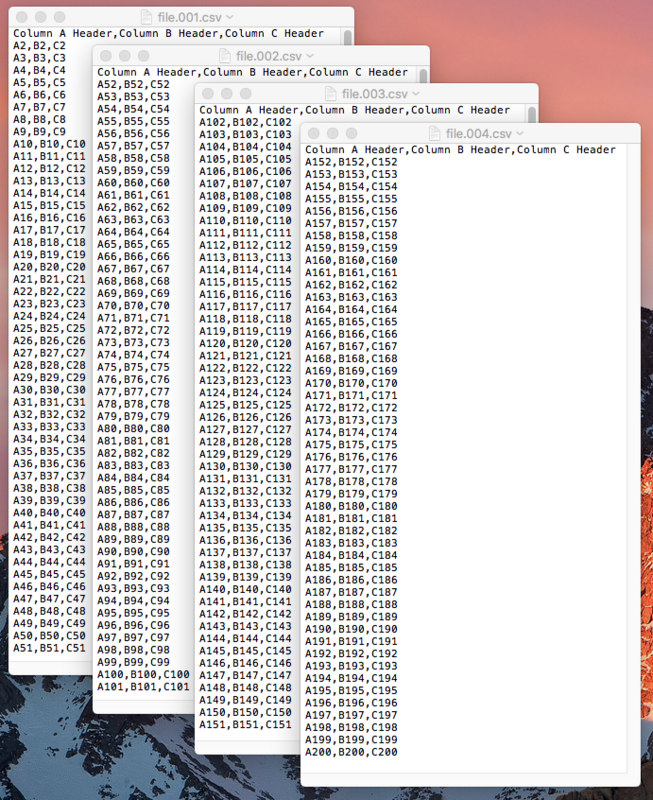 As presently coded, it handles files with a line count of up to 49,950 split to 50 line files, not counting the header. Note that no error handling is coded for the total line count of the source file, however, could be easily added. for s in $t/tmp.a?? ; do and rm $t/h.tmp $t/tmp.a?? to: $t/tmp.a??? display notification "Splitting of the target file(s) is finished!" with title "Split CSV File(s)"
display notification (item 1 of input as string) with title "Split CSV File(s)"
This enables the output of the echo commands in the Run Shell Script action to display a notification if a output file already exists or when the splitting is finished. Note that while notification could be done from within the Run Shell Script action using osascript, nonetheless, I did it this way as it was easier to code. 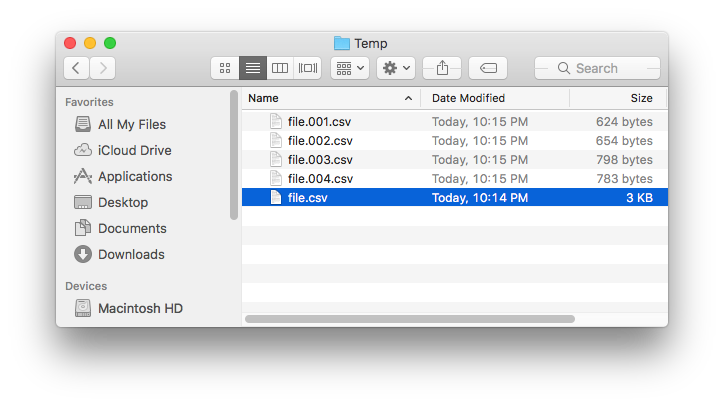 This was tested on a file named file.csv in Finder, which has 200 lines in it, and the images below show what was created by the Run Shell Script action portion of the Automator service when run on the file. Not the answer you're looking for? 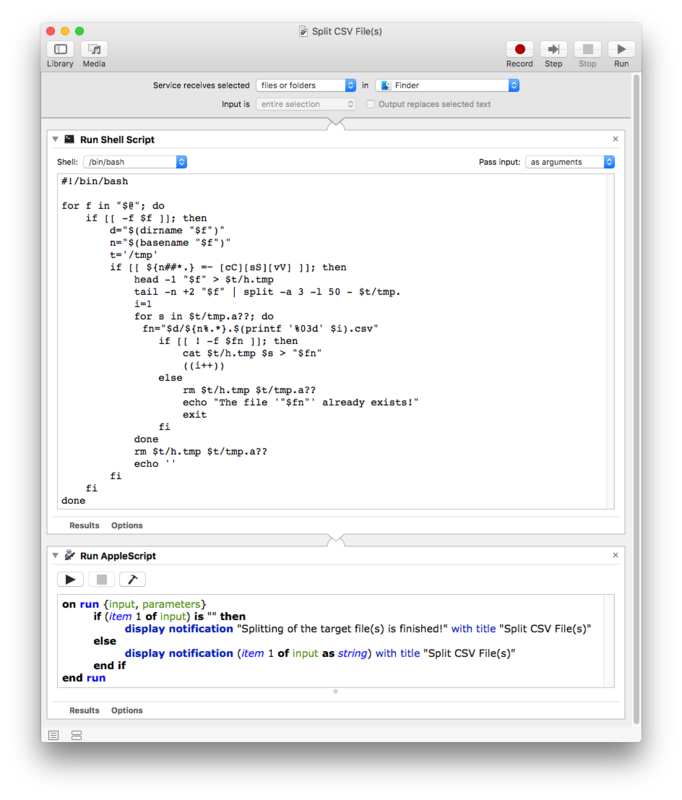 Browse other questions tagged macos finder bash automator . How to commit a file with TortoiseHg?